What is one of the first things you do each morning? Sure, you brush your teeth, but what’s next? A hot cup of coffee. Did you know that over 150 million people in the United States drink coffee every day? What’s more, 68 percent of people drink a cup of coffee within the first hour of waking up! It’s obvious, we Americans sure do love coffee. However, we also love our bright white smiles, and coffee is notorious for staining teeth. Words cannot espresso how much coffee means to us, which is why in this blog, we are going to brew you a pot of helpful information on coffee, the effects it has on your teeth, and how you can prevent coffee teeth staining! With all the goodness coffee brings into our mornings, like wine and soda, the beverage can also have some negative side effects on your teeth. Coffee is quite an acidic drink, and all acids tend to wear out the enamel on your teeth. Over time, this can affect not only the appearance of your teeth, but it can also lead to tooth decay, or cavities if you do not properly care for your oral health. 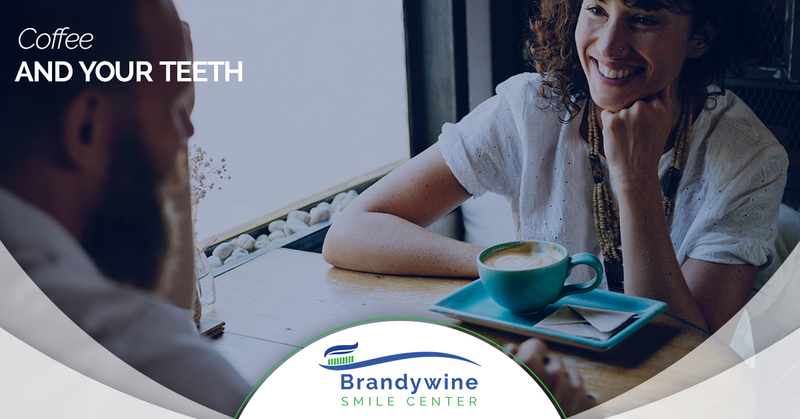 Of course, the best way to avoid coffee teeth stains is to stop drinking coffee altogether, but we know, even for some of us here at Brandywine Smile Center, that option is definitely off the table and is non-negotiable. However, there are ways that you can either minimize the effect of coffee or at least avoid its effects of our teeth in the long run. First, you can begin to drink your coffee at specific times during the day and brush or at least rinse your mouth afterward. The staining elements of coffee can be more easily eliminated, prolonging the whiteness of your teeth. Of course, proper oral hygiene and routine cleaning appointments can do a lot to minimize coffee staining on your teeth. But if stains have gotten ahead of you, a professional teeth whitening treatment will be your best bet for a bright smile. If you are looking for teeth whitening dentist in Glen Mills, Brandywine Smile Center offers both in-office teeth bleaching as well as take-home teeth whitening kits, complete with customized trays and prescription-strength whitening gel. Just wear the gel-filled trays for about 20 minutes a day, and you will be rewarded with a brighter, whiter smile. It’s hard to imagine a life without coffee, which is why it is so essential to ensure you maintain proper oral hygiene and routine teeth cleaning appointments to prevent tooth staining. If you are interested in scheduling a dental appointment, contact Brandywine Smile Center today!